Let’s take a violent example first: the Stonewall Riot (wikipedia). Here the disabling problem was this: police forces, including the NYPD, had both the ability and the clearly-enjoyed tradition of violently raiding and breaking up the festivities of queer people. This was a standard scenario to shutdown a gay bar, even if the Stonewall Inn was a bit more loved than some others, and the criminalization of transpeople and police beating and rough treatment of arrestees was standard practice. But the moment became politicized: “Gay power” was shouted and “We Shall Overcome” sung. Submission to police violence, however, would have replicated the pre-existing situation, not disrupted it. The out-and-out confrontation against police raiding and looting the Stonewall Inn was destructive to property and an act of violent self-defense. It was the end of an impasse, changing participants’ attitudes to authority and themselves. And the insurrectionary mood spread through the local community, amplifying into several days of confrontations. The anniversary of the riots became the Gay Pride parade tradition and gay rights groups spread continent-wide within months. In short, collective violent self-defense interrupted a cycle of submission that had functioned through frequent nonviolent arrests. Switching to a nonviolent example, we could consider the Montgomery Bus Boycott, or the SNCC-affiliated wave of sit-in protests. These stories are now classed within “the Civil Rights movement” as overall super-example for nonviolence whose history is familiar to most (US)Americans. But it’s worth noting that for every such spark that we remember in this history, there were many that failed to catch ablaze. Rosa Parks was but one of a long string of black people who refused to give her seat on a Montgomery Bus; only the seemingly in reach prospect of public desegregation and the tireless efforts of she and her community in organizing the boycott campaign made it a national story. In short, a solitary act of dignified nonviolence, followed by collective boycott broke the situation open. It should be added, however, that Claudette Colvin’s arrest on the same charges, which she forcibly resisted, directly inspired Parks. A third classic example comes in the form of the 1930s sit-down strike waves. Workers occupied their factories during strikes, a choice that brought all kinds of benefits:the sit-down strike provides a clear-cut place for organizing, eliminates employers’ option of hiring replacement workers, and keep striking workers (and often their community) actively involved in the strike. The fact that workers control of the factory itself and the capital equipment within it provide security against a violent assault (during which they might be damaged) and leverage for negotiation since further profit is impossible while the plant remains in workers’ hands. As compared with an outdoor picket, the interior of the workplace is shielded from the weather, more tactically secure against police and strikebreakers’ violence, and better suited for sustained campaigns. After a wave of strike at GM, begun by the Flint Sit-Down, the UAW became the US’s largest industrial union and a wave of sit-downs unionized various other sectors until they were criminalized by the National Labor Relations Board in 1939. Quick question: Were the sit-downs a triumph of “violent” or “nonviolent” tactics? Answer: Both. The leverage of sit-down strikers depends in large part on the implicit or explicit threat to destroy factory property should a raid occurred. From Flint in 1936 to the May 1968 general strike in France to the 1980 Solidarity strike in Poland, this threat has been prepared carefully. Further, the GM strike wave triumphed in part by defeating a police intervention when workers fought back, an incident that became known as the Battle of the Running Bulls (“bulls” was an old-style term for cops). More recently and dramatically, I argue, the Egyptian uprising used first nonviolent then physically confrontational tactics to solve a very disabling problem: the complete lack of reliable safe space for public dissent. (My narrative here draws on the detailed ethnographic work of Dimitris Soudias, on my panel at AAA last November.) Several narrow formulas dealing with the national police’s systematic policy of breaking up protest gatherings and arresting all their participants had been worked out in the decade before: generally, these consisted of using one or two prominent spots for protests organized by lawyers, or turning Friday prayers at prestigious mosques into the gathering places for rallies. Focusing on “foreign” issues which might be endorsed by the government (like Palestinian rights) was also a popular strategy for making mass demonstrations possible. All of these, though, had their obvious limits, and the question of where, when, and how to directly challenge a decades-old dictatorship for its own misrule weighed upon would-be organizers. Between the inspirational success of Tunisia’s revolt and social media-spread calls for #Jan25, the when question was resolved. And the next key element was a combination of nonviolent marching and locational diversity. Small marches across Cairo, in the neighborhoods instead of the most prominent downtown locations, were not immediately dispersed or surrounded by police like previous actions. For the police, there was uncertainty about whether such spaces needed to be controlled, while their refusal to crackdown gave more participants hope to join in. As I covered earlier, photocopiable protester media encouraged a strategy of gathering in neighborhoods and generating large groups that could converge downtown, as well as a packet of suggestions on directly deterring police suppression, many of which were confrontational (spray paint their riot shields, for example) if not directly violent. Once numbers grew and protests concentrated on symbolically important spots, permanent occupation became a strategy for answering the when question: the answer was right now, and whenever you come we’ll be here. Around the same time, protesters combatively refused to be dislodged from spaces of value to them. They held them, and indeed gained them in the first place, by violently resisting police control. This was not a contest of equals: protesters were unarmed, but numerous, while police were essentially the opposite. And protesters prevailing generated the space of possibility for (1) more people to join them and (2) people to realistically hope that the regime would not be able to shut this movement down. Back to Occupy: Occupy Wall Street quickly managed to solve two problems that had made protesting the economic crisis/growing economic inequality/corporate rule of the political system extremely difficult. The mobilizing problem was how to get a critical mass of people actively protesting at once, when most protest calls attract only a small number. The solution was camping in a central, symbolically important square, a solution OWS imported wholesale from elsewhere, most visibly the indignados protest in the Spanish State. Bloombergville protesters against city budget cuts had discovered a legal loophole in camping on sidewalks; OWS people copied this and extended it to privately owned public spaces like Zuccotti Park. 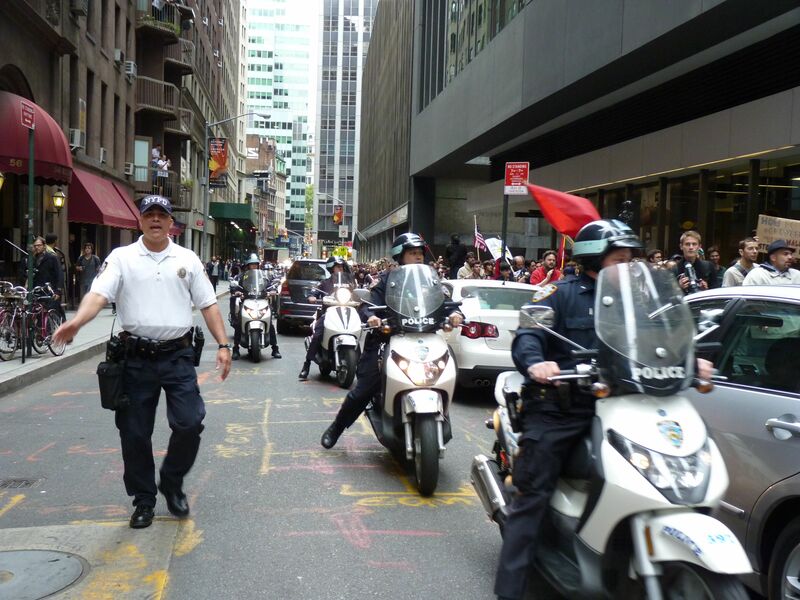 The tactical problem was how to deal with NYPD’s aggressive, persistent tactics of protest response: surrounding, caging with barricades, deploying outsized numbers of police, etc. The response was a mix of persistence (we’ll be here all day, all week), assertive nonviolence, and a balance between holding whatever space was permitted and repeatedly claiming more space whenever the opportunity arose. Protesters were neither allergic to being inside the barricades (a predeliction I developed after just weeks of dealing with the NYPD strategy), nor comfortable remaining inside police control. Over time, they also learned to pick up barricades and use them as their own tool for controlling space, particularly on the November 17 day of action. Flashback to Seattle’s 1999 World Trade Organization protests (wikipedia), the first time I had to deal with this problem. Two things still really worked once Seattle police turned to tear gas: A) Outlasting tear gas with orchestrated lockdowns and sit-ins. That is exactly what it sounds like: handfuls, dozens, or hundreds of people, informed that they would be tear-gassed organized, prepared as best they could (mostly vinegar-soaked bandanas), and willed themselves to wait it out. I saw this happened again and again, and participated through several rounds. Police who wanted to clear the streets with tear gas (and they wanted to use tear gas because they had no plans to arrest thousands that day) often failed. 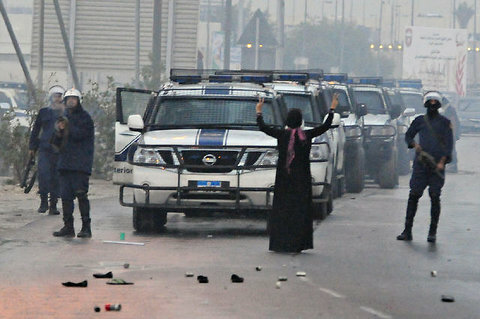 Moreover, the commitment shown by people who heard that tear gas was coming and sat down in defiance was electrifying. B) Improvised barricades and throwing back tear gas canisters: The other main option is clearing out a large neutral space between the mass of protesters and defending it by throwing back the chemical weapons police are throwing your way. A small number of committed people, ideally with baseball gloves and dumpsters, can hold space for quite a while this day. This was my first encounter as a civil disobedience activist with masked Black Bloc protesters, and by and large their relationship with me was one of useful protection. A simple, but effective tactic. Now, both of these strategies have weaknesses: (A) can fail when the police escalate to projectiles; our movement simply doesn’t have thousands willing to use their bodies (and eyes and internal organs) as less-lethal projectile absorbers. Nor does standing before concussion grenades and wooden bullets attract new participants in the same way that bravely outlasting tear gas does. (B) can and did fail in the absence of solid space-claiming tactics that hold particular spaces. Most dramatically, it failed in Miami during the November 2003 FTAA protests where hours of police assault pushed several thousand of us out of downtown. There’s a thin line between being mobile and being chased, and the faster the pace is the harder it is for a large group to function cohesively. The combination of tear gas, mass arrests, mass police deployments, and projectile weapons became known as the Miami model, but it remains (along with the NYPD barricade bullying) the other key tactical conundrum activists face today. For help, with these problems, we can be thankful for the Bay Area as a place of experimentation. Eight months before Miami, Bay Area activists deployed a combination of strategy (A) and #OWS-style milling around, with a sprinkling of (B) for good measure, in a first-day-of-the-war shutdown on the San Francisco financial. Police busy dealing with arresting people sitting down in intersections, militant and/or flamboyant blockading devices, and relentlessly recombining crowds and marches failed to get a handle on the overall situation through two business days. Nor, however, did the SFPD turn to projectile weapons. So, can seizing and claiming space, and holding it by refusal to move be continued when the police add a projectile assault to the mix. 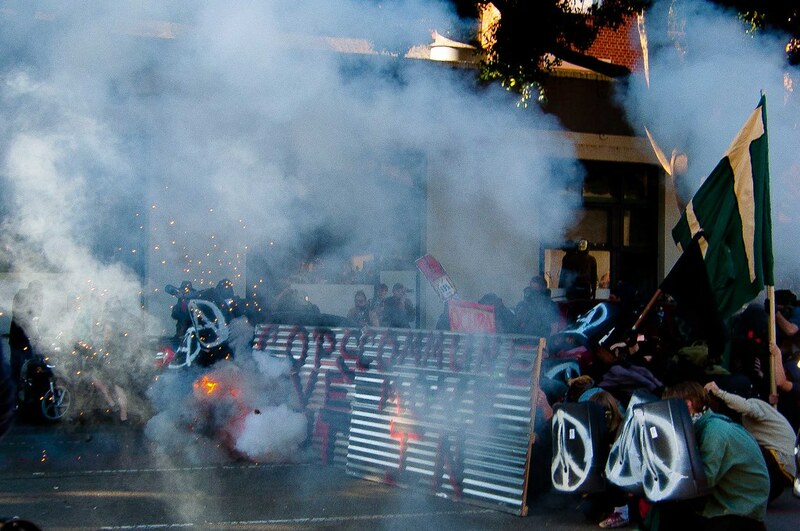 This is precisely the tactical problem faced by Occupy Oakland since the October 25, 2011, police raid. Solving this problem would keep alive occupations even when the police turn to the formidable “less lethal” arsenals they’ve been building up and training with since 1999. The key element added to tactical mix by Occupy Oakland protesters has been organized use of shields as an element of crowd defense. 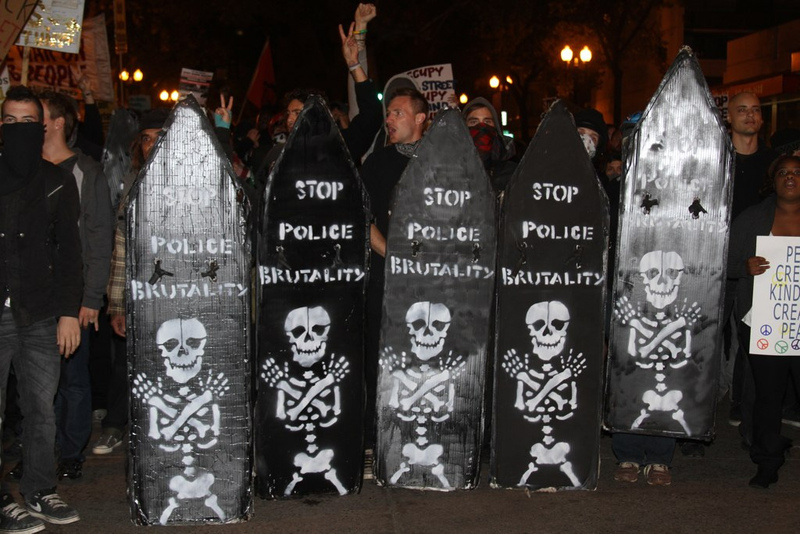 The shields are being used both as physical defense and political symbols. On the January 28 Move-In Day, an publicly announced effort to occupy an abandoned public building as a community social center, shields were upgraded and used as part of a mass effort of over 1,000 people. Critics of Move-In Day’s tactics as self-defeating violence will surely argue that tactical effectiveness is irrelevant because a rigidly nonviolent strategy is The Only Way To Win politically. There are serious problems with this argument, one which no careful observer of Egypt 2011, 21st-century Bolivia, or 1930s America could take at face value. However, there is an implicit core that should be listened to: movements must balance the development of a tactical ability to hold the streets with a strategic ability to bring in ever-increasing numbers of people. In the somewhat de-mobilized political climate of the United States (by world standards, not historical ones), the easiest entry points to political activism are the mass demonstration (primary tactics: marching and milling about) or mass nonviolent civil disobedience (primary tactic: holding space by sitting in). Making these kinds of participation unlikely is a good way to cut off a movement from its base, and just as threatening to continued turnout as the likelihood that police will shut down your protest. The biggest challenge for thinking strategically about such moments, I think, is that most (US)American heads in the strategy game are actually committed not to examining the strategic import of tactics in context, but to winning The Tactical Argument of our time: whether nonviolent action can/is better at/is necessary for/could never/is counterproductive to bringing about revolutionary change. This Argument has generated some important prominent statements, and encouraged genuine reflection, but its existence has polarized many people’s positions by implying that there is a Right Answer lying on one side of the debate. Particular positions on this question have been fundamental to whole schools of thought, including Peace and Conflict Studies and Insurrectionary Anarchism, each of which have their own internal momentum, but neither of which has powered any comprehensive social transformation on its own. Frustratingly, these positions have also shown a remarkable capacity to discount evidence and factual examples which contradict their, at this point, pre-conceived ideas of what is tactically effective and what is not. 2. Drawing serious attention to police violence, and challenging both the criminalization of whole communities and the militarization of police response to protest is a full-time job. Move-In Day was a potential opportunity to talk about long-term problems of police violence, something which seems to have happened more effectively in the foreign press than here in the United States. It also is a task best connected to long-term community campaigns dealing with the locking up of massive numbers of youth and adults of color. Building (and repairing) those bridges (as the Move-In Assembly itself puts it) cannot be done in a day. It’s particularly hard to do in the wake of a day-long battle. It requires showing up (and milling about) at many, many moments where people are already struggling against police brutality, prisons, and criminalization, making those struggles your own. However, during confrontational protest, alliances can be built too. In the 2003 SF financial district shutdown, many (but not all!) working-class youth of color organized autonomously and took a different balance of risks of civil disobedience arrest (generally less, from where I stood), and of risks of directly confronting police when they had the tactical advantage (generally more). Multiple crowd scenarios could help with this when everyone is on the streets together. 3. Successful solutions to tactical problems are those that are contagious; for now, we have yet to solve the police projectile assault as a tactical problem, but I’m looking forward to such a solution, and join those urging restraint in attacking people who are trying to work out a solution. Meanwhile, the following pieces have been a joy to read. Osha Newman, Occupy Oakland: Are We Being Childish? A small group of men, dressed in black clothing and masks and ignoring cries of “Shame on you!” from other protesters, smashed windows and spray-painted graffiti at downtown stores like Nordstrom, Niketown, Starbucks and the Gap. Both were jarring sights in a city that prides itself on its laid-back image. Most of the demonstrators were clearly opposed to the window-smashing and other destructive acts by a small knot of protesters, most of whom were young men wearing masks and declining to give their names when asked by reporters. “Anarchy rules!” said one, carrying a trash can down the street and then using it to smash a window of a Starbucks coffee shop. This reminds me of people telling critics of the US military that they should instead be focusing on the violence of Al Qaeda. In both cases (US military/Al Qaeda and OO property damage advocates/OPD) both sides would like people to believe that their destructive activities are a reaction to the other side. But in both cases (actually all 4) I am am unconvinced. Since I don’t buy into OO property damage as being a reaction to police brutality (not to deny that police brutality exists and is bad), I don’t see the obligation to criticize the OPD violence toward protesters whenever we criticize property destruction being carried out in OO’s name. Besides too much harping on police brutality to protesters makes the movement sound self-absorbed.